It used to be that giving a lump of coal for the holidays was reserved for those who had been very bad. Not anymore. 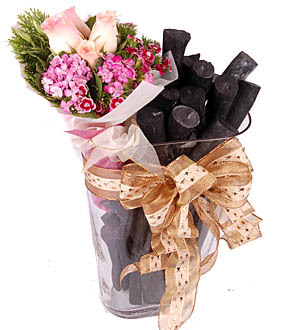 In Japan, binchotan charcoal is a great gift given to people that you care. It purifies the air, dissipates hazardous airborne elements & odors and most importantly it generates negative ions. A truly thoughtful gift to be placed on her working desk and to provide her a less stressful work environment. Nuchu Glass measures 5"x10"width X13.5" high. Gift comes with a posy of roses. Arrives with a story, explaining the binchotan tradition, its benefits and uses, and why she should own a binchotan gift, exclusively from Pods & Petals Giftlab. Approximate weight of Binchotan - 3kg.